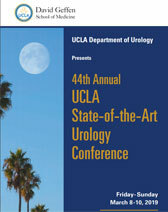 The UCLA Department of Urology sponsors, attends, and/or participates in numerous urological events during the course of every year. The list below details upcoming events in which UCLA staff will be involved. Some of the events are open to the public, while others are highly specialized seminars designed to enhance the knowledge of trained physicians and surgeons. When available, the event description will conclude with a link to websites devoted especially to the specific event. This course explores the most challenging management problems facing the practicing urologist. 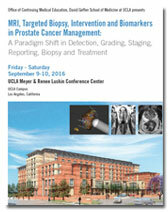 The 3rd Annual UCLA Prostate MRI program is a unique one-and-a-half-day course which will provide a comprehensive overview of the utility of multiparametric MR imaging for prostate cancer diagnosis. The program will discuss all relevant MR imaging parameters for prostate cancer (T2, perfusion, diffusion and spectroscopy) as well as new standardized MR reporting algorithms for prostate cancer. In conjunction with the UCLA Departments of Urology, Pathology, Nuclear Medicine and Radiation Oncology and other world renowned speakers, the program will review application of MR imaging in surgical planning for robotic prostatectomy, prostate biopsy planning, active surveillance and radiation planning. 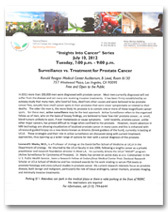 The symposium will focus on the most pressing and challenging issues in prostate cancer research, addressing topics that range from the molecular mechanisms that underlie the disease to various translational approaches. The Symposium is free and open to the public, but registration is required. This course explores the most challenging management problems facing the practicing urologist. Distinguished faculty present current information and techniques in female pelvic medicine and reconstruction, stress urinary incontinence, medical and surgical treatment strategies for overactive bladder, pelvic pain disorders in men and women, management of renal and ureteral stones, men’s health issues including testosterone deficiency and Peyronie’s disease, surgical therapies and technologies for BPH, urologic oncology (including kidney, prostate, bladder, imaging and ablative therapies), biomarkers for cancer detection and management, MRI fusion biopsy of the prostate, castrate resistant prostate cancer, emerging therapies for urologic malignancies, robotic surgical procedures, urologic infections, and practice management including ICD-10 coding. The October 25, 2014 course has been combined with the February 7, 2015 course. Prostate cancer is the second most common solid organ malignancy diagnosed in men. Unlike other solid organ malignancies, the challenge in prostate cancer is to confidently identify men with moderate and high grade cancers who would most benefit from aggressive therapy. This course explores the most challenging management problems facing the practicing urologist. Distinguished faculty present current information and techniques in male voiding dysfunction, incontinence, BPH, female urology, overactive bladder, management of renal and ureteral stones, endourology, robotics, urologic oncology (including kidney, prostate, bladder, imaging and ablative therapies), impotence, infertility, Peyronie's disease, urologic surgery techniques and managing complications, and pediatric urology. The conference emphasizes interaction between participants and faculty and allows ample time for case presentations and group discussions, ensuring an outstanding educational experience for attendees. This course explores the most challenging management problems facing the practicing urologist. Distinguished faculty present current information and techniques in urologic trauma, prosthetic surgery, female urology, reconstructive and urethral stricture surgery, overactive bladder, incontinence, management of renal stones, endourology, robotics, urologic oncology (including kidney, prostate, bladder, testis cancer, imaging and ablative therapies), varicocele management, infertility, hypogonadism, Peyronie’s disease, urologic surgery techniques and managing complications, and pediatric urology. The conference emphasizes interaction between participants and faculty and allows ample time for case presentations and group discussions, ensuring an outstanding educational experience for attendees. 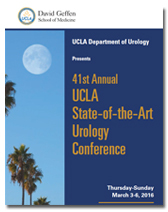 To download a brochure, register for the course or for additional information, please visit UCLA's Office of Continuing Medical Education. 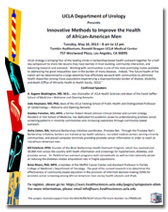 UCLA Urology is bringing four of the leading minds in barbershop-based health outreach together for a half-day symposium to share the lessons they have learned in trust building, community interaction, and balancing research and outreach. Working with communities is one of the most promising routes available to addressing the great inequalities seen in the burden of many diseases. 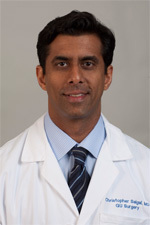 Learn more about an alternative to invasive treatment for prostate cancer, which uses the latest imaging technology to manage this cancer safely. This course will feature didactic lectures on key and evolving issues in the surgical management of genitourinary malignancies along with a broadcast of live surgical cases emphasizing demonstration of critical maneuvers. 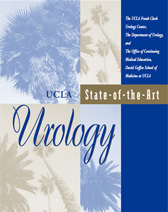 Please visit UCLA's Office of Continuing Medical Education. This course explores the most challenging management problems facing the practicing urologist. 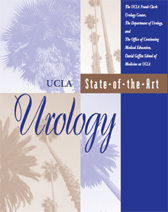 Distinguished faculty present current information and techniques in female urology, reconstructive surgery, overactive bladder, incontinence, management of renal stones, endourology, laparoscopy and robotics, urologic oncology (including kidney, prostate, bladder, and ablative focal therapies), medical therapy for BPH, interstitial cystitis, prostatitis, and pediatric urology. The conference emphasizes interaction between participants and faculty and allows ample time for case presentations and group discussions, ensuring an outstanding educational experience for attendees. The goal of the conference is to provide attendees with new information that they can directly apply to their clinical urology practices. 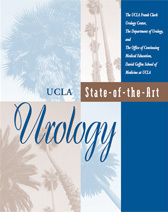 Please visit UCLA's Office of Continuing Medical Education. 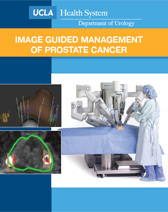 The UCLA Department of Urology cordially invites you to a CME course on Advanced MRI Imaging and Prostate Cancer Management. Participants are provided a hands-on experience on a simulated patient, using state-of-the-art robotic surgical technology. 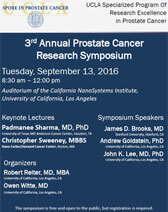 This course will introduce the latest advances in MRI imaging of the prostate based on more than 7 years of experience at UCLA. In particular, this short seminar will cover the latest information on integration of MRI into clinical management of prostate cancer, with a focus on the use of imaging in robotic prostatectomies and the use of MRI imaging in ultrasound-guided targeted biopsies of prostate cancer. This course is targeted towards urologists. To download a brochure, register for the course or for additional information, please visit UCLA's Office of Continuing Medical Education, Attendance is by RSVP only by June 8, 2012. 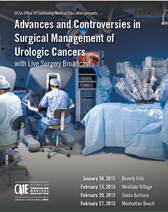 This course explores the most challenging management problems facing the practicing urologist. Distinguished faculty present current information and techniques in female urology, reconstructive surgery, overactive bladder, incontinence, management of renal stones, endourology, laparoscopy and robotics, urologic oncology (including kidney cancer, prostate cancer, bladder cancer, and testicular cancer), medical and surgical therapy for BPH, testosterone replacement therapy, erectile dysfunction, and pediatric urology.